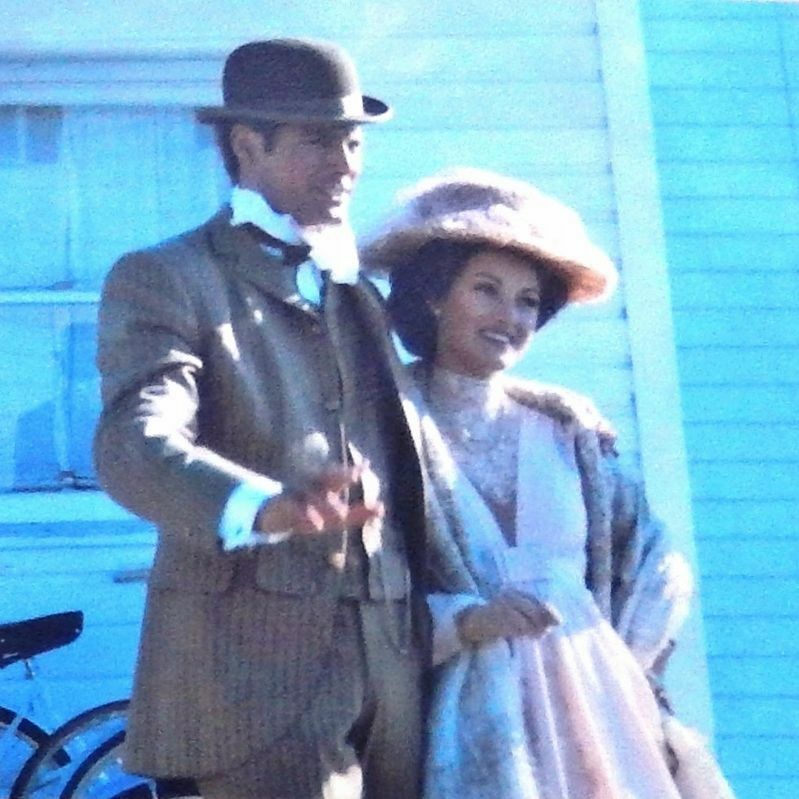 During the summer of 1979 the movie Somewhere in Time was made on Mackinac Island. Starring Christopher Reeve, Jane Seymour and Christopher Plummer, the romantic fantasy tells the story of a man who wills himself back to 1912 to meet a woman he became captivated with after seeing her portrait. 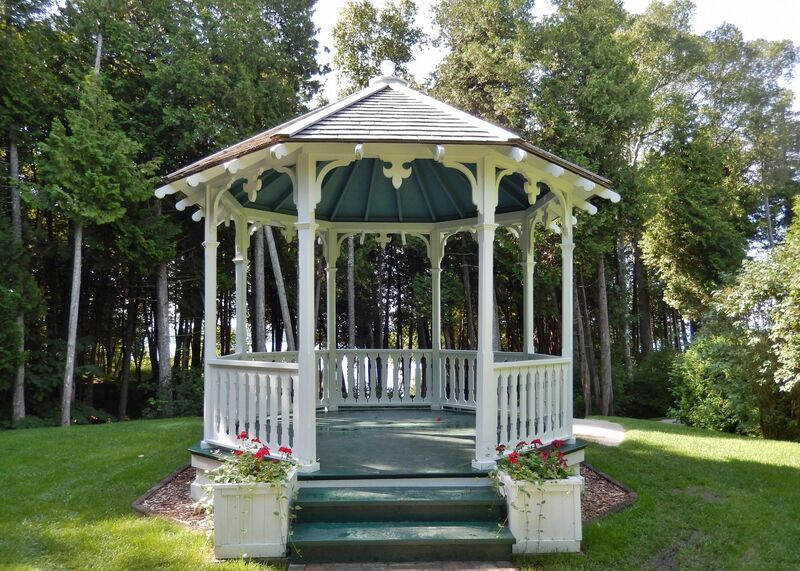 Except for a few scenes filmed in Chicago, the entire movie was shot on Mackinac Island. Numerous island locales were used, including Grand Hotel and the soundstage at Mission Point Resort. Released in 1980, the movie did poorly at the box office, but has gained a loyal following. 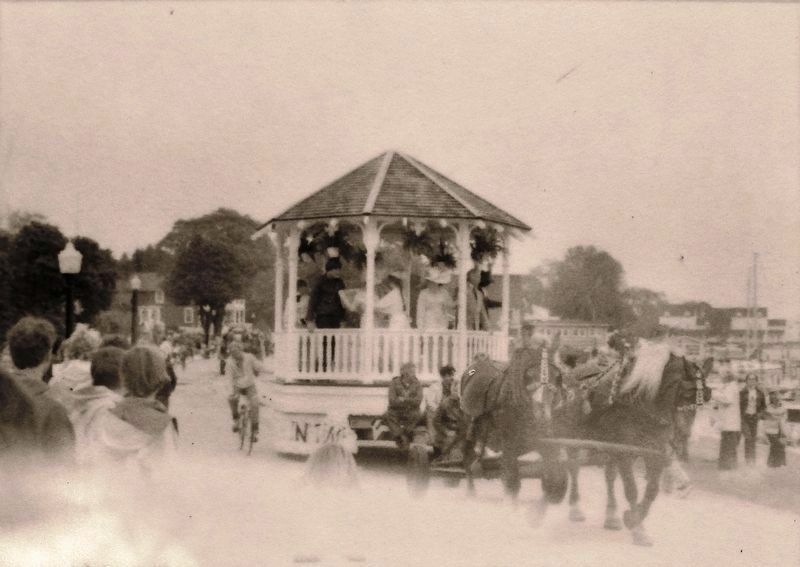 The production company employed the state park to construct this gazebo for a scene shot near the public school. 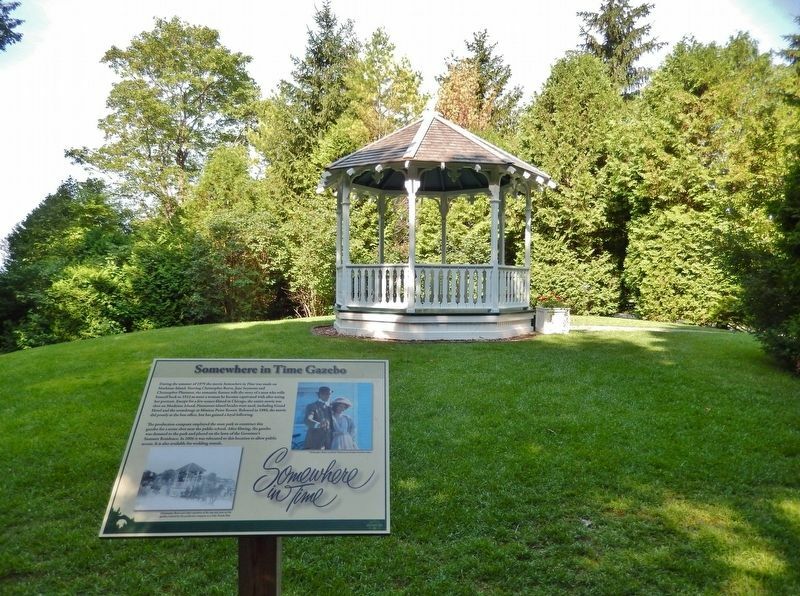 After filming, the gazebo was donated to the park and placed on the lawn of the Governor's Summer Residence. In 2006 it was relocated to this location to allow public access. It is also available for wedding rentals. Christopher Reeve and other members of the cast and crew on the gazebo, entered by the production company as a Lilac Parade float. Street. Touch for map. Marker is located near the subject gazebo, about a 1/10 mile walk west from Huron Road on Anne's Tablet Trail. Marker is in this post office area: Mackinac Island MI 49757, United States of America. Touch for directions. Other nearby markers. At least 8 other markers are within walking distance of this marker. Greany Grove (about 400 feet away, measured in a direct line); "Cass Cliff" (about 400 feet away); Scout Barracks / Parade Ground (about 500 feet away); Historic Fort Mackinac (about 500 feet away); Island House (about 700 feet away); American Fur Company Store (approx. 0.2 miles away); Lawrence A. Young Cottage (approx. ¼ mile away); Sainte Anne Church (approx. ¼ mile away). Touch for a list and map of all markers in Mackinac Island. More. 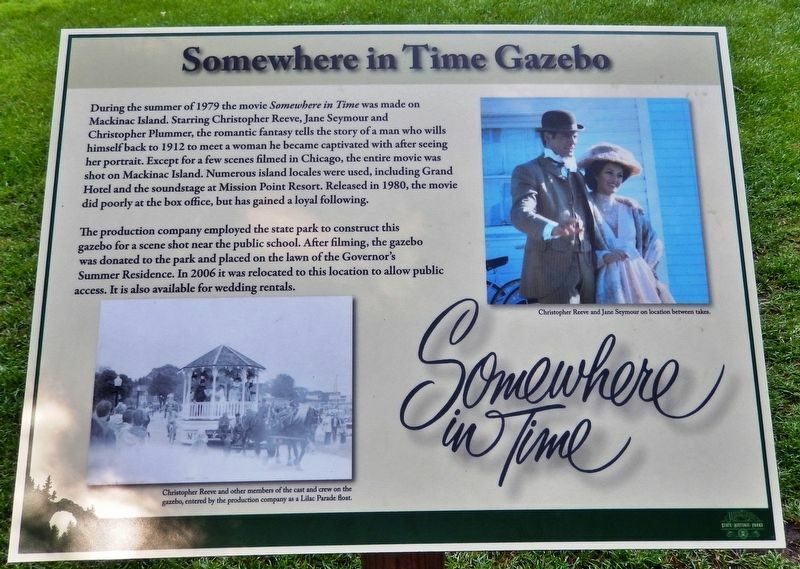 Search the internet for Somewhere in Time Gazebo. Credits. This page was last revised on April 5, 2019. This page originally submitted on April 5, 2019, by Cosmos Mariner of Cape Canaveral, Florida. This page has been viewed 62 times since then. Photos: 1, 2, 3, 4, 5. submitted on April 5, 2019, by Cosmos Mariner of Cape Canaveral, Florida.